Selling without a script, often happens when the customer jumps in with questions, or forces you to present before you have any information about what they want. It happens a lot in retail sales and informal selling situations. You can't always stop a customer and ask them to start at the Introduction or Questioning stage. And in some cases you want to keep their momentum going, especially if they have a product in mind. The article below will outline how retail sales teams, and others, that I've managed prepare to give an adhoc presentation at any time. Even though they have very litle knowledge of the features or benefits the customer wants. 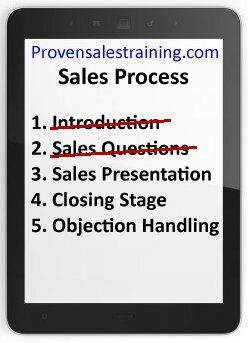 When a customer is not following your sales script and the conversation starts at the presentation stage, how do you sell to them? The customer interrupts and takes control. They're not behaving as customers should. They haven't allowed you to go through the stages of introducing you and your business. The big problem is, they haven’t gone along with your sales process. You haven't been able to ask them questions to determine their requirements, so you're selling without a script. They can have a product or service in mind, and you find yourself answering questions and starting at the presentation stage of the selling process. But you're not equipped with any information on their needs. Instead of you asking them questions it becomes a conversation with them questioning you. In informal selling situations such as retail sales, selling direct to the public in their own home, and to small or independent businesses, you often find customers don't follow your sales script.